Signed bottom left and titled bottom right, watercolor with brown ink on paper laid down to mat at edges. Image: 6 1/8 x 9 1/8 in. (15.6 x 23.2cm), sheet: 10 1/2 x 14 1/16 in. (26.7 x 35.7cm). George Clive Esq., Herefordshire, England, United Kingdom. By descent in the family. Spink & Son Limited, London, United Kingdom. Patricia & John Roche, New York, New York. 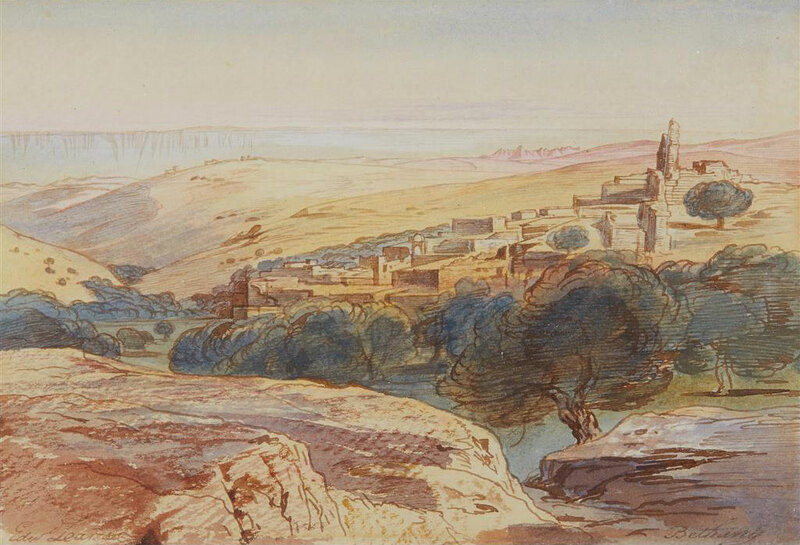 This entry was posted in Edward Lear and tagged Edward Lear, landscape, Palestine, travel, watercolours. Bookmark the permalink.